Best Commercial Construction Loan Companies | Compare Now! If you need to expand your business premises or relocate, it’s usually not practical to pay for it out of your working capital. You need to keep the business running at the same time as preparing your new premises, so you probably don’t want to affect your working cash flow. A commercial construction loan is a short-term, unsecured loan that is tailored specifically to provide businesses with the funds they need to prepare commercial property without having to draw on their working capital. Commercial construction loans can be used either to build or renovate premises that you’ll be occupying yourself, or to create commercial property for investment. They are usually short-term lasting just for the life of the project, which is about 12 to 36 months. Although construction loans are generally unsecured loans, you can put up collateral against the loan to get a lower APR. Average rates for commercial construction loans are higher than the average commercial real estate mortgage, but as always, the rates you’ll get depend on your particular financial situation. What to Look for When Choosing a Commercial Construction Loan? Construction loans can cover all the way up to 100% of the costs of the building, but others ask for a down payment of anything between 10% to 30% of the estimated final value of the property. If you need 100% financing, you’ll do best with a government-backed SBA 7a construction loan, but paying a bigger down payment does reduce the amount of interest you’ll need to pay. When you agree on the terms for your construction loan you’ll also agree on a draw schedule. Instead of being given all of the funding in one lump sum, you’ll receive it in stages spread across the life of the project. A draw schedule is confirmed between the borrower and the lender, so make sure that the draw schedule suits your needs and will provide you with the necessary funding at the right time. With most construction loans, you’ll be paying off only the interest on the loan, since the capital will be repaid in full at the end of the project when you replace your construction loan with a traditional commercial real estate mortgage. Although this makes the rates lower overall, it’s still an important pull on your finances so look for the best rates you can find. 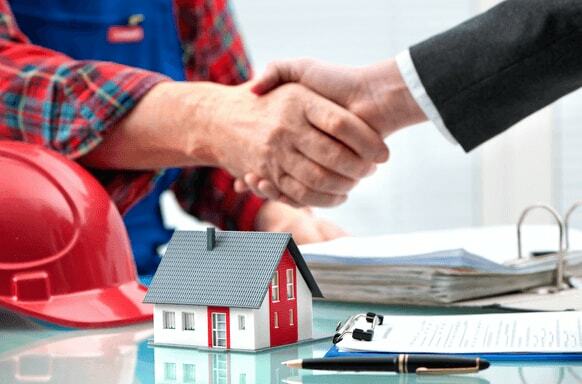 Very few online lenders specifically offer construction loans. However, there are a host of lender marketplaces who present a selection of business loans that are both secured and unsecured. A combination of an unsecured short-term loan followed by a secured line of equity enables businesses to fund most construction projects. By keeping both the unsecured construction loan and the secured mortgage on the finished property within the same lender, borrowers can streamline their applications and increase their chances of getting good loan terms. Lendio is a lender marketplace that offers loans from over 75 different trusted loan providers. As a loan aggregator it doesn’t give an exact APR, but it does advise borrowers that the highest interest rate is 30%. Lendio gives businesses a choice between ten different types of business loan, which increase the chances that you’ll find a short-term loan that suits you. To apply to Lendio you simply need to complete a short online questionnaire. Lendio will then match you with the right lender for you to complete a more detailed application form. Lendio doesn’t charge any fees but some individual lenders do charge such fees. New businesses fare well with Lendio because it only asks for a minimum of 6 months in business and requires no minimum credit score. However, you will be asked to show an average monthly revenue of at least $10,000 for the last 6 months. To apply you’ll need to share 6 months of current business bank account statements and a mortgage or landlord verification as well as completing the application form. LendingTree is also a loan aggregator that connects small businesses with lenders. The loans on offer through LendingTree include traditional short term business loans and working capital loans as well as merchant lines of credit and equipment financing. LendingTree requires you to complete an online application form which is shared with a number of lenders who then submit bids for your loan. LendingTree helps you compare loan offers and choose which is best for your construction project. One of the biggest advantages to getting funding through LendingTree is that the funds come through in as little as a few days, so you don’t need to delay starting your new project. As a loan aggregator, LendingTree can’t tell you what your rates will be since those are set by the individual lender. The lender is also the one who charges any fees and extra charges – LendingTree itself doesn’t charge a fee. To get a loan through LendingTree you’ll need to have been in business for at least 12 months and enjoy an average revenue of $8,000 per month. Different lenders have other specific requirements regarding minimum credit score and financial standing. Wall Street Funding specializes in providing loan options to small and medium-sized businesses with poor credit scores. It focuses on the business’ broader financial track record rather than on the credit score, making it ideal for newer businesses and those struggling with poor credit. Wall Street Funding offers merchant cash advances against outstanding receivables instead of a classic loan, which makes it a good fit for some businesses. Wall Street Funding doesn’t charge any upfront fees or compound interest and can get the money to you in as little as 72 hours. Detailed information about rates, terms, and other issues is provided after the loan is pre-approved. Kabbage is an online lending platform that offers open business lines of credit to businesses of all sizes. There are no traditional business loans available but there is the useful flexibility of a credit line. You can withdraw funds whenever you’d like, up to your approved maximum, making it easy to manage the need for extra funds at various points in your construction project. Kabbage manages its APRs differently, charging a flat monthly fee of 1.5% to 10% of your loan and there are no upfront fees. Interest is only charged on the amount you’ve withdrawn, not on your maximum approved credit line. Applying for Kabbage is fast and easy. It’s all done online and approval can come through within just minutes. You don’t need any minimum credit score to get a loan through Kabbage but you do need to have been in business for at least 12 months and have an average monthly revenue of $4,200. BFS Capital offers both short-term business loans and merchant cash advances to small businesses. It is a direct lender that doesn’t operate according to a traditional interest model. Instead, BFS Capital charges a flat fee that varies according to the size of your loan. Information about the size of the fee isn’t available online – the fee and exact length of the repayment term are both discussed once you’ve been preapproved for a loan. Application for a loan from BFS Capital is fast and online. Once you’ve been approved, funding often comes through as soon as the next day. To be eligible for a loan through BFS Capital you’ll need a minimum credit score of 600, to have been in business for at least 2 years, and to show an average of $15,000 in monthly revenue. Commercial construction loans can offer funding of up to 100% of your project while taking into account your construction schedule. If you’re eager to organize a construction loan, one of these five business loan providers will keep your costs covered.